I volunteer at the National Maritime Museum’s Travellers’ Tails pop-up gallery in Lewisham shopping centre. Soon after starting, fellow volunteer, Jacob and I were permitted to take objects handling training further and try to use a Victorian octant – those beautiful, triangular compass-like instruments – the world’s first Sat Nav, and key to surviving at sea. Jake was a history student and seemed fascinated by the mechanisms of the thing, which was perfect for me, as I was interested in his learning arc. According to National Maritime Museum’s notes, the octant was the gadget that had empowered Captain Cook to locate the Polynesian islands off Australia. It was a gift to try to use it, to follow Cook. Our example had a mahogany frame and limb with a brass index arm and fittings including ivory plates on the crossbar. 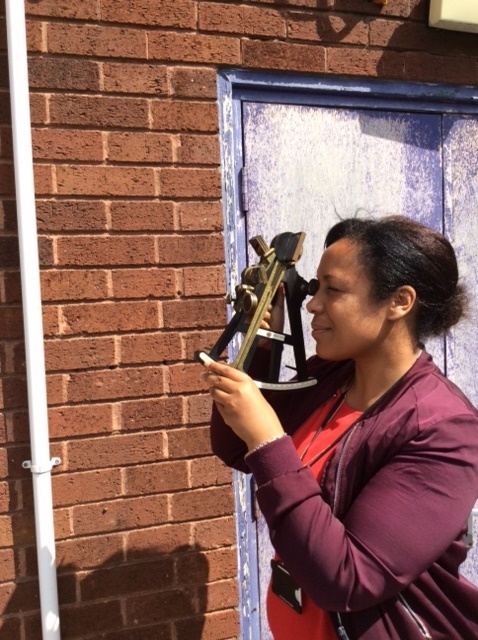 These help to find the height of the Sun above the horizon to determine a ship’s latitude. We carried the octant in its violin-like case and onto the desolate roof of Lewisham shopping centre, the bustle of Lewisham market below and blue skies above. We climbed up a metal fire escape to search for the horizon. Jacob had a go first, while I snapped him with the ipad. The idea is to look into a narrow window, and that by pulling a gear up and down along an ivory ruler and moving the nob, an image would align on a mirror and glass to reveal the sun… which would produce a mark on the ‘tape measure’ and give us latitude. That all important gap from the sun to the horizon pin points one’s place in the world; an exquisite navigation tool. Jake grimaced. It was not a geeky, train spotting exercise. He was doing something important. When I looked through the pinhole aperture, I felt pressured. 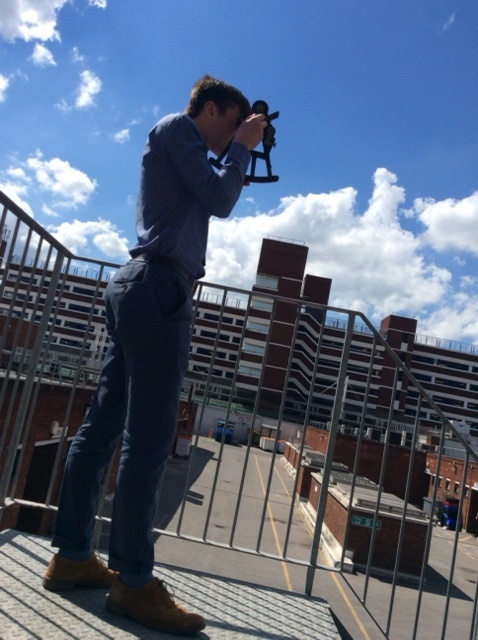 Searching for anything in the blue sky…. A dot of tree in the distance, almost made me embody a teeny part of Cook’s euphoria and relief at finding sun or land. The horizon escaped us in our urban spot. Hard to fathom all of Cook’s seafaring men, looking to him to master it. 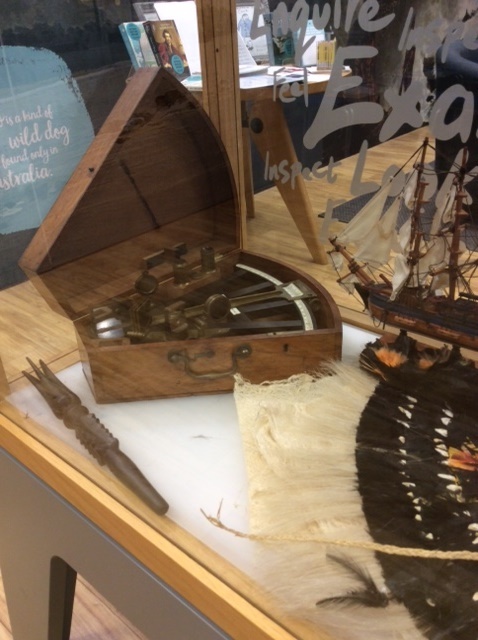 The octant, generously shared at the Traveller’s Tail’s pop-up exhibition in Lewisham, is helping us see captains like this as skilled people, thrilled by discovery. I thank the National Maritime Museum for helping me gain perspective on British Imperialism.